Braji Language spoken region in India. Braj Bhāshā (Devanagari: ब्रज भाषा; Gurmukhi: ਬ੍ਰਜ ਭਾਸ਼ਾ), also called Brij Bhāshā (बृज भाषा, ਬ੍ਰਿਜ ਭਾਸ਼ਾਾ), Braj Bhākhā (ब्रज भाखा, ਬ੍ਰਜ ਭਾਖ), or Dehaatī Zabaan (देहाती ज़बान, ਦੇਹਾਤੀ ਜ਼ਬਾਨ, 'country tongue'), is a Western Hindi language closely related to Hindustani. In fact, it is usually considered to be a dialect of Hindi, and along with Awadhi (a variety of Eastern Hindi) was one of the two predominant literary languages of North-Central India before the switch to Hindustani (Khariboli) in the 19th century. Brij Bhasha is spoken by people in the nebulously defined region of Vraja Bhoomi, which was a political state in the era of the Mahabharata wars. According to ancient Hindu texts such as the Bhagavata Purana, the kingdom of King Kamsa is described as spreading through the Brij (also known as Vrija or Vraja), where the incarnation of Krishna was born and spent his childhood days. This region lies in the Agra-Mathura-Aligarh area, and stretches as far as the environs of Delhi. 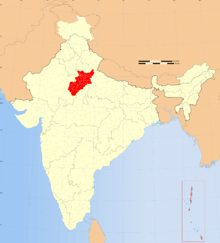 In modern India, this area lies mostly in northwestern Uttar Pradesh, the eastern extremities of Rajasthan i.e. Bharatpur & Dholpur and the southern extremities of Haryana. Northern regions of Madhya Pradesh like Morena are also included. Today Braj Bhoomi can be seen as a cultural-geographical entity rather than a proper state. It is the vernacular of the region and boasts a rich culture and literature by famous poets like Surdas, Bhai Gurdas and Amir Khusro. Brij Bhasha is very close to Avadhi, spoken in neighbouring Avadh region. Much of the Hindi literature was developed in Braj in the medieval period. However, today Khariboli dialect has taken its place as the predominant standard dialect of Hindi. It stretches across the Ganges into the non-Doabi districts of Badaun and Bareilly and goes up to the foothills of Nainital at Udham Singh Nagar in Uttarakhand. as well as parts of Karauli, from where onwards it merges into Rajasthani languages. Most Braj Bhasha literature is of a mystical nature, related to the spiritual union of people with God, because almost all of the Braj Bhasha poets were considered God-realised saints and their words are thus considered as directly emanating from a divine source. Much of the traditional Northern Indian literature shares this trait. All traditional Punjabi literature is similarly written by saints and is of a metaphysical and philosophical nature. Yugala Shataka by Swami Sri Sribhatta Devacarya; known as the first 'Vani' book in Vraja Bhasha composed in the 14th Century AD as a part of Nimbarka Sampradaya tradition of Radha Krishna worship. Kahan ja roye (to a male , Kahan ja rai hai (to female) ? Where are you going? kaha kar roye ( to male), kaha kar rai hai (to female)? What are you doing? tero naam kaah hai (to male )? What is your name? kaah khayo? What did you eat? kaah hai rayo hai? What's going on? moye na pato. I don't know. toy kaah dikkat hai ? What is your problem? kaha koye re tu? What's the name of your place? Ghar kon- knon hai re? Who's at home? tero ghar kahan hain? Where is your home? Roti kha layi kaah? Had your meal? kaah hall-chal hai? How are you? bataya to hato I told you. je lali meri hai . She's my daughter. je humaro lallu hai He's my son. tu kab awego ? When you will be coming? Tero hi baat dekharo. I was waiting for you. Tera byah hai go kaah? Are you married? Kahan koon/ kit koon jaro hai? Which place you are going to? yahah / nyah aa . Come here. je bus kitau ja rai hai? Where will this bus go? ↑ "Census of India: Abstract of speakers' strength of languages and mother tongues –2001". censusindia.gov.in. Retrieved 16 July 2015. ↑ Hammarström, Harald; Forkel, Robert; Haspelmath, Martin; Bank, Sebastian, eds. (2016). "Braj". Glottolog 2.7. Jena: Max Planck Institute for the Science of Human History. 1 2 "International Encyclopedia of Linguistics". google.co.uk. Retrieved 16 July 2015. ↑ "Google Notebook". google.com. Retrieved 16 July 2015. ↑ Sujit Mukherjee (1998). A Dictionary of Indian Literature: Beginnings-1850. Orient Blackswan. pp. 425–. ISBN 978-81-250-1453-9.